In February 1974, the House of Representatives commenced proceedings to consider impeaching President Richard Nixon. Political investigations began in February 1973 when the Senate established a Committee to investigate the Watergate scandal. The public hearings of the Committee were sensational, including the evidence of John Dean, Nixon’s former White House Counsel. The Committee also uncovered the existence of the secret White House tape recordings, sparking a major political and legal battle between the Congress and the President. On February 6, 1974, the House of Representatives passed House Resolution 803 by 410-4 to authorise the Judiciary Committee to consider impeachment proceedings against Nixon. The work of this Committee was again the spotlight a quarter of a century later when Bill Clinton was impeached. 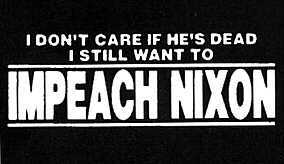 In 1974, the House Judiciary Committee recommended Articles of Impeachment to the full House of Representatives, but Nixon resigned before the House voted on the Articles. Hence, Nixon was not impeached during the Watergate scandal. The only Presidents ever to have been impeached were Andrew Johnson (1867) and Bill Clinton (1998), both of whom were acquitted in their Senate trials.